Few sights can reawaken memories of happy holidays of yesteryear as vividly as the superb railway posters that were so much a part of the great age of mass rail travel. Between the 1930s and 1950s - regarded by many as the heyday of advertising graphic art - a huge range of posters appeared, bearing slogans proclaiming the attractions of such resorts as 'Weston-super-Mare - in Smiling Somerset', and presenting a colourful picture of Britain at its best. Through images as diverse as bustling cities, scenes of rural tranquility and majestic mountain landscapes they offer an escapist paradise, where appealingly uncrowded beaches basking in permanent sunshine are just a train journey away. This beautiful collection includes over 80 vintage posters from the 30s, 40s and 50s, with individual poster captions describing the artists and locations depicted. 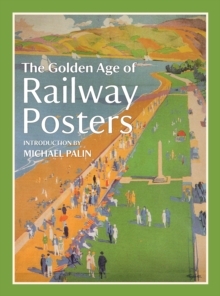 Michael Pailin recaptures the spirit of the great days of railway holidays and train excursions in his entertaining introduction - an era that is both within living memory and yet part of a bygone age.